Uninterrupted quality time, perfect slopes and restorative family meals – what’s not to love about a family ski holiday? Before you start trying to answer that question with travel expenses, hefty lift pass prices and the après ski drinks bill, have a read of this. It’s easier than you might think to have a cheap family ski holiday without compromising on fun. 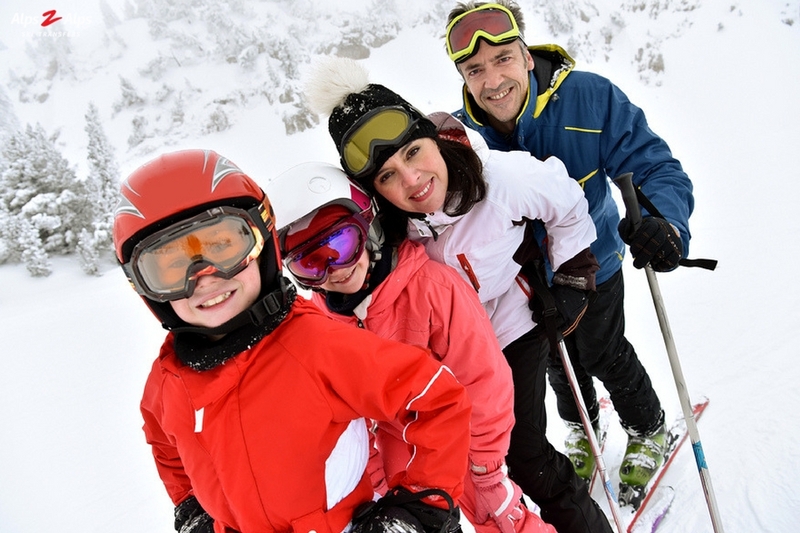 Here’s our advice on how to keep costs down when booking a family ski holiday. First things first, choosing the right family-friendly ski resort is key when planning a budget ski trip. Luckily, Europe is home to loads of great value resorts with fantastic skiing areas. In the French Alps, try out Tignes, La Plagne or Avoriaz which are all great cheap ski resorts for families. If you’re looking to visit somewhere in the Italian Alps, the peaceful resort of Courmayeur is a safe bet. Or, if Austria and Switzerland are more your scene, we recommend Alpbach and Grindelwald. When planning a family ski trip, it’s worth keeping an eye out for ‘famille-plus’ resorts in which you’re guaranteed to find great facilities and activities for all ages. The next big thing to consider is when to travel. Your choice of ski holiday dates could make all the difference to your bank balance! Unfortunately, avoiding school holidays isn’t really an option for a family ski holiday. However, a ski trip during Easter is likely to be cheaper than one during the peak-season February half term. Another way to save is to travel midweek which can be up to 60% cheaper than going on a weekend! From chalet hotels to luxury ski chalets, your choice of accommodation can make a big dent in your holiday budget. A ski hotel offers anything from bed and breakfast to full board. The benefits of staying in a ski hotel are that there is a team of staff to help you with anything you may need, and you don’t have to worry about cooking! There are great budget hotels throughout the Alps run by friendly locals and expats to help keep costs down. A self-catered ski apartment or shared chalet is a great way to save. 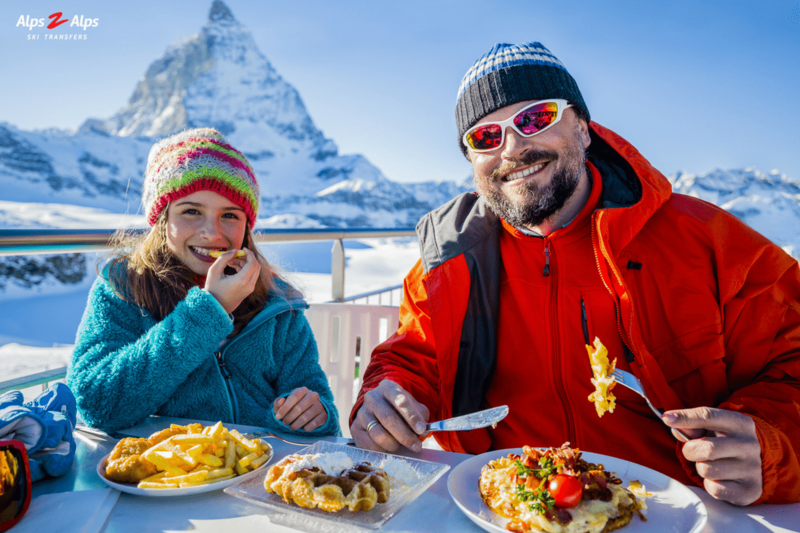 Cooking your own family meals together can be a lovely experience and means you have some privacy to come home to after a day on the slopes. The early bird catches the worm, which is just as true for ski holidays. Booking early means you can get your pick of the best accommodation and save money on travel and flights. That being said, some skiers thrive on finding last-minute ski deals which can really shave some money off the bill. The only problem with last-minute is that it can be tricky when traveling with young children. With most people travelling to the Alps by plane, this is an area you can make serious savings. Booking early is key here. 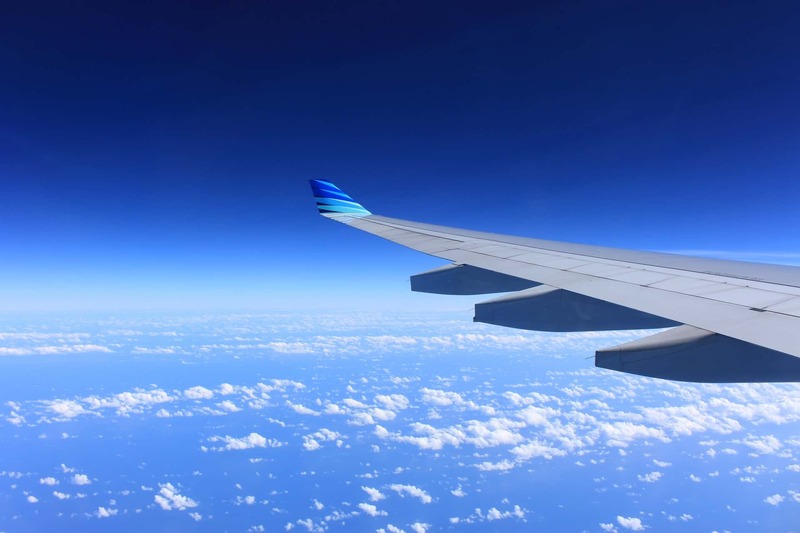 If you can get away with travelling late or very early morning this can also bring costs down- although a 4am flight with youngsters might not be your idea of a holiday! Remember to clear your cookies when buying flights online and look around at nearby airports if you can’t find affordable flights at your first choice. You may hear people raving about package ski deals, but here’s a secret for you… we think doing it yourself is often the cheaper option! Not only can it cut costs, but it also gives you more flexibility to tailor your holiday to your family’s needs and interests. Always exchange money before you leave to avoid the hefty exchange rates at the airport. When it comes to ski equipment, it’s not always worth buying your own. Not only is it a substantial initial investment, it can also cost you in excess baggage fees at the airport! An easier alternative is to use a reliable ski equipment hire service. Alps2Alps have ski rental hubs in convenient locations around the Alps, including nearby Geneva airport. Instead of waiting in a queue at your resort, pick up your skis and boards en-route! Our team of expert technicians will be on hand to find suitable ski hire equipment for the whole family. While most people head to the mountains for their ski lessons first thing, they might be missing a trick when it comes to saving money! Although the best snow can be found early morning, because of this popularity, some ski schools offer discounts on lessons in the afternoon. Particularly helpful if you’re a large family! If you’re travelling with children aged under five, some ski passes mean they can ski for free! Shop around for the best family ski passes to make big savings. Although tempting, lunch on the mountain can be a pricey affair! Packing your own picnic lunch is a great way to cut spending and is often a healthier option than the cheese laden offerings found in mountain restaurants! Thankfully, many resorts have allocated indoor and outdoor picnic areas, and as the weather warms, these outdoor spots will become lovely rest points. Skiers with their eye on the ball can take advantage of great special offers and ski deals online. Make this job even easier by downloading the Alps2Alps ski transfer app. This way, you can take your pick of any offers that come your way. Instead of taking an expensive taxi to your ski resort or spending a small fortune in airport or resort car parks, a ski transfer can take away this hassle and expense. Get picked up directly from the airport and be delivered in comfort to your chosen resort by an experienced driver. You might be surprised at how much this can save you! Family holidays are the perfect excuse to relax and unwind with your loved ones. Make your next family ski holiday a stress-free experience by booking a ski transfer with Alps2Alps. From five-star ratings to knowledgeable drivers, a transfer with Alps2Alps is all about quality journeys at bargain prices. Download the app for the latest offers or head to the Alps2Alps booking page for a speedy quote!